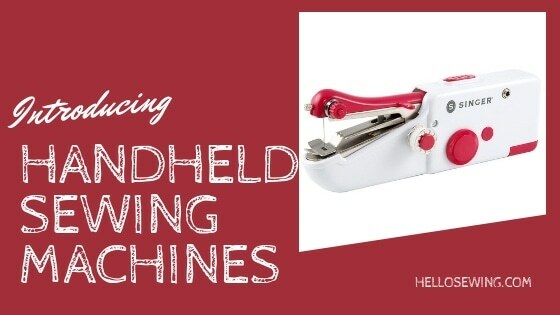 →Best Handheld Sewing Machines – Which one is for you? People love handheld products and they love mini versions of bigger appliances or technological devices they use. Handheld gaming consoles, handheld printers, handheld computer but also handheld vacuum cleaners, handheld lawnmowers and handheld power tools are just some of the most popular ones in the category. Then why not make a handheld sewing machine? Exactly, why not? Sewing machine manufacturers saw the chance and they took it and because of that, you can now find a lot of handheld sewing machine models out on the market. Of course they are inferior both to the full sized models and the mini sewing machines as well but they do fit in your pocket and they can do some sewing work which is good enough. Which ones are the best ones? I believe it’s time to find out so let’s do that. Forget about carrying a needle and a thread around with you at all times so you can fix your wardrobe pieces while you’re away from home. We’re in the 21st century now, you have a handheld sewing machine for that. This Royalsell model is small enough so that it fits in the palm of your hand but it can do some basic fashion repairs or alterations without a hitch. It can be operated while plugged in to a power adapter but you can also equip it with batteries and use it anywhere at any time. This handheld sewing machine sews a single thread single stitch and it works best with materials that are 1.8 millimeter thick. If it’s too thick or too thin than the machine may not be able to work with it. You can do some precise sewing thanks to the rotary wheel adjustment and you can also adjust the tension accordingly. Fastening plate holds the material down so you don’t need to worry about it slipping out while you sew. Repair broken hems or ripped pockets, change the hemline on your trousers or just add some decorations to your wardrobe. The machine comes threaded so you can use it straight from the box. It’s very affordable and if it seems to malfunction, the manufacturer will send you a new one instead. Avoid using batteries that aren’t equally charged and also avoid using the machine when it gets hot. This model is a really good choice for people who travel a lot but want to be able to do some quick fixes and repairs of their wardrobe when necessary. It’s very light at only 240 grams and it fits into the palm of your hand. It’s powered by four AA batteries but you can also purchase a power adapter and use it while it’s plugged in. You will need to use both hands while operating MSDADA because you have to hold the material with your left hand while holding the machine with your right hand. When you push the button it will start sewing while moving the material in the appropriate direction. Since this is a single stitch model, you will have to tie a knot by yourself once you finish sewing. With this machine you can fix curtains without putting them down, sew on your clothes while they’re still on you, or repair bedsheets while they’re still on the bed. The machine is pretty affordable and in the package you’ll get the MSDADA itself, an extension spindle for using the large thread spools, a needle threader, two needles, three bobbins with thread, a soft tape measure and a user manual. If you don’t want to search for a socket so you can plug in your handheld sewing machine then this model will pique your interests. Singer is a powerhouse when it comes to manufacturing sewing machines because they have some history behind their back and their machines older than 100 years still work without any problems. This means that you won’t have to worry about it breaking down or disappointing you down the road. This model is great for people who like to do quick sewing repairs or alterations but don’t want to spend a lot of time on it. It isn’t an all purpose sewing machine but it does what it’s supposed to and it does so very well. It works best with lightweight materials but in theory it can also work with leather. Along with the machine, you’ll get some bobbins, needles, a thread and a thread spindle. The four AA batteries needed to run the Stitch Sew Quick are not included so you’ll have to buy them yourself. This one is not so different than the ones we’ve reviewed already. This is a normal handheld sewing machine meant for very simple sewing work. This little guy is here for you while you are on the go or whenever you fancy doing some quick light sewing tasks around the house. It’s very easy to use and it’s also quite affordable so you can even start your little task if you’re feeling enthusiastic. Quick repairs and alterations will be a breeze once you get a hang of it. I admit it is a bit tricky at the begginning but hey, you don’t need to take down the curtain to sew that little hole in there. Back to the usual handheld sewing machines we go. This model is very similar to the MSDADA we mentioned a while ago, in fact they are basically identical. Velmaz handheld sewing machine can be powered by four AA batteries or by a power cord, both of which you’ll have to purchase yourself. It’s very lightweight and can fit in your pocket, which makes it a great choice for travel options or just to keep in your car so you can quickly use it if an occasion occurs. Hold the machine with your right hand and gently press the button while you hold the fabric with your left hand and direct it accordingly. This model stitches only one straight stitch and you’ll have to tie a knot by yourself once you finish your work. The packaging contains the Velmaz handheld sewing machine, an extension spindle for using the large thread spools, a needle threader, two needles, bobbins with thread, and a user manual. This is a nice gift for your mother or sister, maybe even brother or father if they tend to rip their clothes accidentally now and then. The product comes with a six month guarantee so you don’t need to worry about losing your money. But it’s quite affordable so it wouldn’t matter that much anyway. These handheld models are very inferior to portable sewing machines, let alone regular ones. But they are pretty cheap, easy to use, fit into the palm of your hand and are much better than just a plain needle and a thread. If you want the possibility to quickly fix some tears or rips on the go then they’ll suit your needs. But if you want to create new pieces from scratch or add some complex decorations to your clothes or such, then these models aren’t for you at all.